When Christi (Love From The Oven) and Michelle (Sugar Swings! Serve Some) asked me to participate in their "Spring Hop Along Peeps Party", I was more than happy to join in on the fun! I'm not sure there's a more iconic candy associated with Easter than Peeps ( though chocolate bunnies are a close second;))! 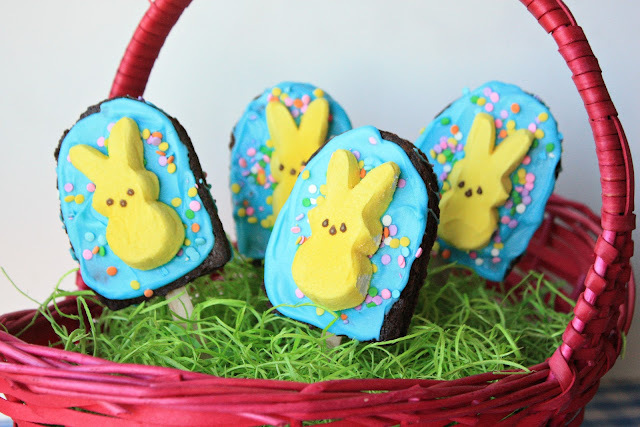 I thought that I'd share an easy-peasy, but yummy treat, to feature these bright, bunny Peeps. It doesn't really require a recipe, but just a few short steps to end up with a fun and fabulous Easter pop. 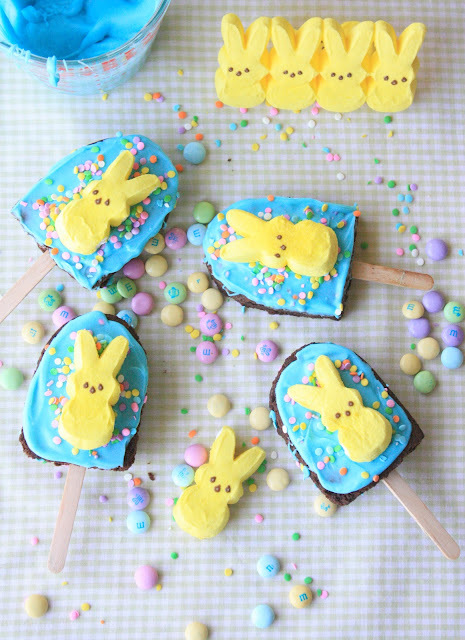 I used a brownie mix (hence the easy-peasy label), candy melts, bunny Peeps, popsicle sticks and sprinkles. Simply bake up a batch of brownies in a 9x13-inch pan, and bake according to package directions. Let cool completely, and then cut into rectangles big enough to accommodate the bunnies (I used a cookie cutter that is shaped like an ice cream bar). Insert the popsicle sticks. Melt the candy melts according to package directions, and use a small, offset spatula (or knife) to spread the melted candy over the front of each brownie. Add sprinkles and then the bunny while the candy melts are still wet. Voila! You now have some colorful and yummy Peeps Brownie Pops! Ready for more fabulous PEEPS recipes and ideas??? 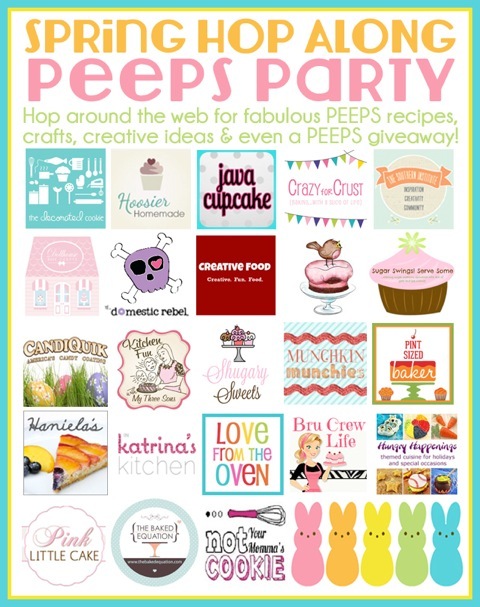 Visit the following websites, each is sharing an amazing PEEPS post for you today, so hop on over and check them all out! 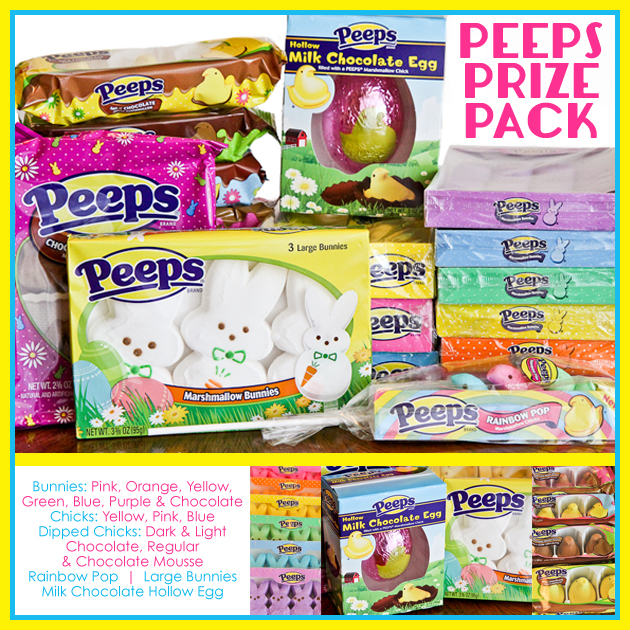 Don't forget to enter to win the fabulous PEEPS Prize Pack (below) as well! Happy Spring! yay! I could use a peeps brownie pop right about now!!! thanks for playing along! Thanks so much for the invite, Michelle! XO! I knew you would come up with something adorable as usual! Love them!! SO adorable Sue! I love pops and I love brownies. The peeps are perfect! Sue, these are just too adorable! The perfect Easter treat! These are too cute for Easter!! So vibrant!! Cute! My favorite Peep treat are the ones dipped in dark chocolate....ooooh, and peeps s'mores! Mmmm, dipping in (dark) chocolate is a great idea! You are so brilliant! Before I read the post I was just staring at the shapes. So cool that you used an ice cream cutter! Oooh! What a cute idea! Simple and so fun! You always share the funnest things. I can't wait to make your bunny buns again this year. I just woke up, am hungry, and could sure use one of your Peep brownies. Can I come over? Sorry you had a stressful day, but am glad your post is up and you got everything resolved. Peeps and brownies together...what a great idea and very cute. The kids would love these in their Easter baskets. Totally cute and adorable, Sue :) Love it! 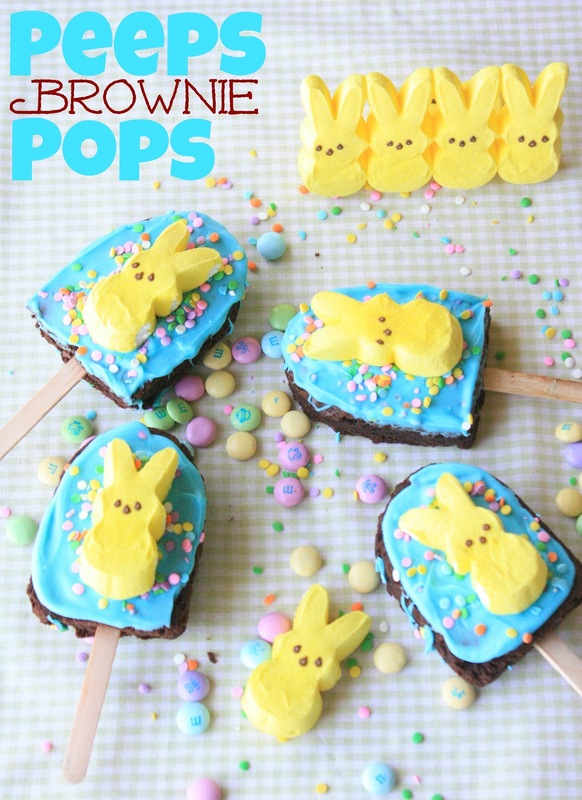 Brownie pops with Peeps on top look like the absolute best kind of Easter treat to me!!! I love that they are on popsicle sticks!!! In a smore, or melt them and use them in rice krispie treats or popcorn balls. I enjoy peeps plain out of the box and with my husband. I enjoy them right out of the box when they are still fluffy and soft! thank you so much for the chance. so cute! Awe I want to win that peeps pack not fair. Your fun and easy to follow recipe is a great showcase. Brownies, frosting and Peeps ... it can't get any better than that! Peeps every Easter I can't wait. Those sticky sweet marshmellow bunnies and chicks never have a chance once they get jump in my shopping cart hop into the car and travel all the way home..oh wait!! rare they ever make it home, somehow they never seem to make it past the car.Poor things just don't stand a chance.Ohhh how I love my Peeps! Cute ideas! I love to make S'mores with peeps. Sometimes after making them I dip the ends in white chocolate. A favorite way to eat them is to open the pacakge and let them get a little firm. To be honest I'll eat them any way I can get them - probably my most favorite Easter treat. I'm glad you can get them for most holidays. Im making up Easter treat bags for my nieces & nephews containing s'mores ingredients, including Peeps for the marshmallows!